The energy efficiency community has fallen in love with Intelligent Buildings. The imagery is strong; AI and machine learning, IoT, big data and cloud, all making energy operating decisions based on the weather, the building’s process, it’s occupancy and the utility’s real-time energy rates. Yet most commercial and industrial buildings don’t even have a functional building management system if they have one at all. The consumer analog is still Nest, the Wi-Fi connected thermostat that makes your home smarter through cloud accessible intelligence. But Nest provides intelligent control of your HVAC – not your home’s appliances, lighting and computers. For C&I, the bigger challenge and opportunity is managing all energy loads, their timing and alignment with dynamic utility program economics. It requires a view to the whole building. Progressive building managers know energy can be managed as a variable cost but developing a building-wide intelligent BMS is a swing for the fences proposition. Our vision is that the only place where all building systems will eventually be connected for intelligence is the cloud. Until vendors catch up with the vision, we think companies should focus first on making their buildings digital – meaning – adding electronic access to the energy consuming end-points. With this digital overlay, companies gain fast investment return for visibility and are set up to leverage external Nest-like intelligence from a wide variety of vendors and service providers. In the last few months we revisited the aged framework and found, remarkably, it still applies. Yet there was a new addition: Network Connectivity. Today getting building end-points online is a lot easier. Companies are more comfortable with IoT and cloud solutions within their operations. Where years ago, we had couples therapy sessions with corporate IT, today adding building system access for visibility and control has become more acceptable, easier and cheaper. Once digital, companies can focus on the more important part – adding intelligence with a connection to management decision making. Intelligent buildings will require a federated model, where companies maintain a mix of control levels – full, shared and outsourced – depending on their management requirements. Initially a company’s core process systems might be in their full control, while HVAC (like Nest) is shared and battery storage is completely outsourced. Longer term, with all buildings and utilities becoming fully digitally accessible, you have to wonder why any company would want or need control of anything outside of its industrial processes. Energy management is on a path for full outsourcing, and it’s more a question of how we get there. 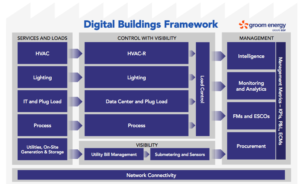 So, we think starting with Digital Buildings today is an intelligent step in the right direction.